Lauren Ralph Lauren Flora Rib-Knit Decorative Pillow, 18"Sq. Rib-knit pattern pillow. Solid-hued knit back. Knife-edge finish. Feather insert. Cotton. 18"Sq. Machine wash. Imported. Textured canvas pillow with beading. Front and reverse: cotton. Lining: polyester. Embroidery: acrylic. Dry clean. 20"Sq. Imported. Ralph Lauren Home Aiyanna Decorative Pillow, 20"Sq. Linen pillow in yarn dyed striped pattern. 0.5" stitch down tailored flange around all edges. Visible button closure. 320 GM/SQM. 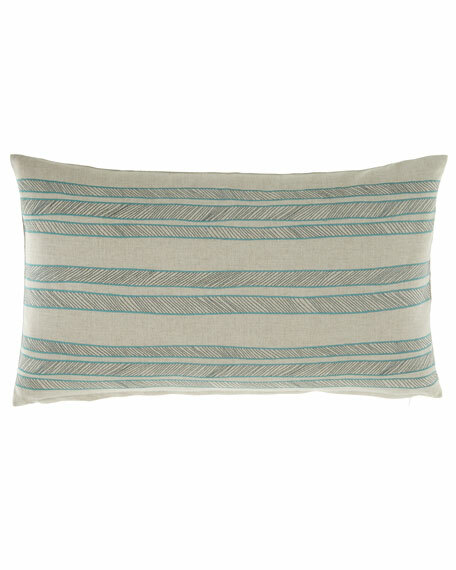 Linen pillow in yarn dyed striped pattern. 0.5" stitch down tailored flange around all edges. Visible button closure. 320 GM/SQM. Machine wash. 20"Sq. Imported. Pillow with embroidered frame at front. Concealed back bottom zip closure. Includes feather pillow insert. Shell, linen; lining, cotton; embroidery, polyester. Knife-edge finish. 15" x 20". Machine wash. Imported.